The “soap shed” where Mountain Spring Soaps are made. 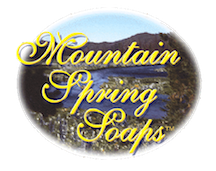 Handmade in east Tennessee near Tellico Plains and the Cherohala Skyway, Mountain Spring Soaps is dedicated to giving it’s customers great products. We use the natural spring water that comes out of Cane Creek Mountain – not chlorinated “city water.” This and other quality ingredients combine to produce fine soaps and personal care products. Sorry - the shed is not open to the public. Please visit our Where To Buy page to get more information on the many things to see and do in the Tellico Plains area.